The iron meteorite, at the left, fell in Argentina, at Campo del Cielo, Gran Chaco Gualamba. Campo del Cielo means Field of the Sky or Heaven. There's an oral tradition that says the iron metal "fell from heaven." There are at least 26 craters in an area that's three kilometers wide by 20 kilometers long. The total weight of its pieces is more than 1,000 tonnes (tonne=1000 kilograms). The largest piece weighed 37 tonnes. Considered as one meteorite, the pieces together make it the heaviest ever recovered on the planet. The specimen shown here weighs about nine pounds, and its nickel content is 6.68%. It also contains gallium, cobalt, germanium, phosphorus and iridium, the second densest element and a metal of the platinum family. 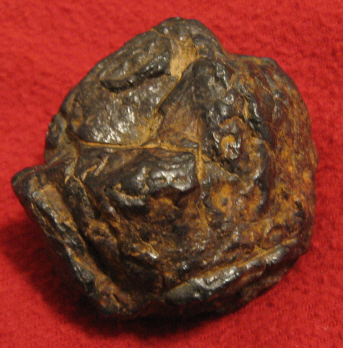 The meteorite has regmaglypt "thumbprints" caused by ablation as the meteor passed through the atmosphere. Regmaglypts may be formed by vortices of hot gas. 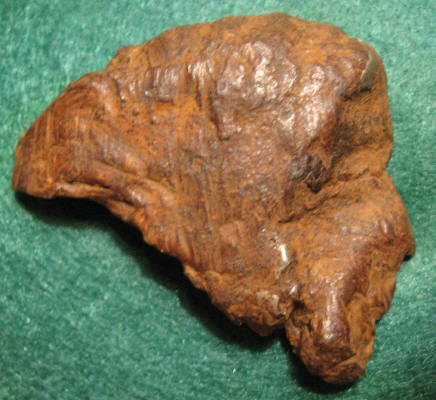 The shape of the meteorite here, suggests a head, maybe a man of Colonial times. The nickel-iron meteorite on the right fell near Odessa, Texas, and weighs about 125 grams. This meteorite is said to have fallen about 50,000 years ago making a crater 600 feet in diameter, and was discovered in 1923. Thousands of pieces have been found and are in museums round the world. When cut and polished, and etched, slices of it show a crystalline pattern called Widman-statten lines. A publication by R. S. Dodson from Moorhead Planetarium, Chapel Hill, North Carolina, says, "No natural terrestrial material produces these lines, and all efforts to produce them on man-made alloys have failed." 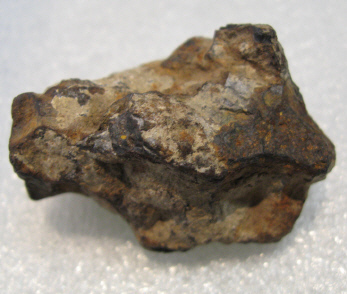 A meteorite is a rock or chunk of metal or a combination of the two, that falls from outer space, surviving its burning entry through the earth's atmosphere. When it is seen as a "falling star" it's called a meteor. When it's still out in space, it's a meteoroid. The word meteor comes from the Greek meteōros, high in the air, as does meteoric. I wonder if this Greek word is partly derived the Greek meta, beyond or after, for "high in the air" is beyond the surface of the earth. Meta is also found in in the origin of metaphor, metamorphosis and metatarsus. Meteorology comes from the Greek meteoron referring to something happening or perceived in the sky. Meteorologica by Aristotle in 340 BC was about "all phenomena above the ground." 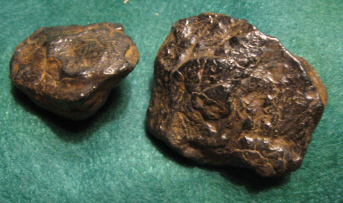 The iron meteorite (left) fell during the day on Febr. 24, 1947, in the forests of the Sikhote-Alin Mountains of eastern Russia at 46º 9' 36" N, 134º 39' 12"E, northeast of Vladivostok. lingered for hours. The estimated speed of entry was 31,000 mph. On atmospheric entry, it began breaking up, yet a group of pieces fell together. At an altitude of 3 1/2 miles the largest mass apparently exploded. The fallen fragments were strewn over an elliptical area of about half a square mile. It made 106 impact holes, some pieces weighing up to 300 kilograms. 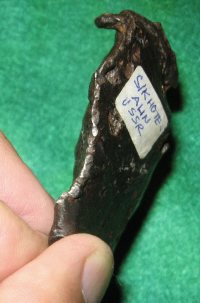 A meteorite from Russia suggesting the profile of an Indian face, even with eyelids. The shiny parts may simply be from rust having been rubbed off. 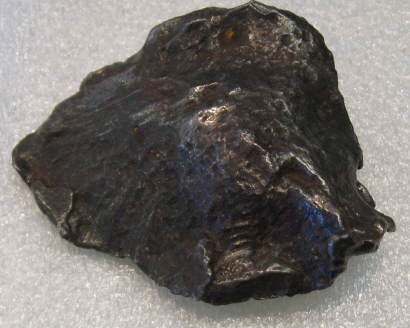 While not visible in this picture, some of the thin edges are bent, perhaps from being forcefully ejected outward from the main meteoric body as it exploded. Note the linear structure on the after part, perhaps indicating the direction of the meteor's fall. You also see on the surface some glob-like structures as if pasted on or even running down on "the chin." One may wonder whether these were the result of a molten effect that stuck. The meteorite is smaller than it appears here, being short of two inches in width, yet by no means the smallest of meteorites found. The origin of this specimen from Russia isn't known. The meteorite at the left came from the B & G Rock Shop in Sioux Falls, So. Dakota. It was found in China by Morton Hahn, known to Bob Johnson of the rock shop. 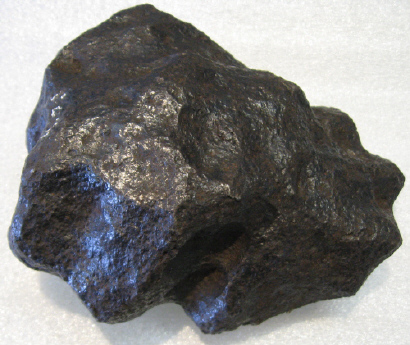 Called a Nantan Iron Meteorite, it fell in 1516 and is recorded in Nantan Co. archives. The record says stars fell from the northwest, "long waving like snakes and dragons, bright like lightning." The area of the fall was around 17 miles long ,by five miles wide. In 1958 China needed steel and people "were told to find heavy rocks rich with iron." However the rocks wouldn't melt, and geologists discovered they were meteorites. Below are two more meteorites from China, looking like they are from the same fall. 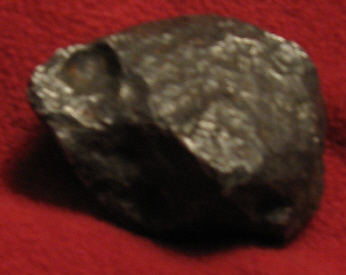 Above, another meteorite from Campo del Cielo, Argentina. Weighing about 15 oz., it seems to be a more solid chunk of metal than the approximately nine lb. specimen from that location, shown at the beginning of this page. Curiously, the larger one will flake off material. This smaller one is pocked with a number of small "craters," one quite evident in this photograph, something like an eye socket.